Can I Use Autoptimize with WP Rocket? A common misconception is that the two plugins perform the same functions. This is not 100% correct. Autoptimize specifically provides HTML, CSS and JS minification. But it does not provide page caching which is the primary feature of WP Rocket. In terms of impact on your site’s loading time, page caching is far more important. Minification is a fine-tuning feature. When the cache of Autoptimize’s minified files is cleared, WP Rocket’s cache will also be cleared. 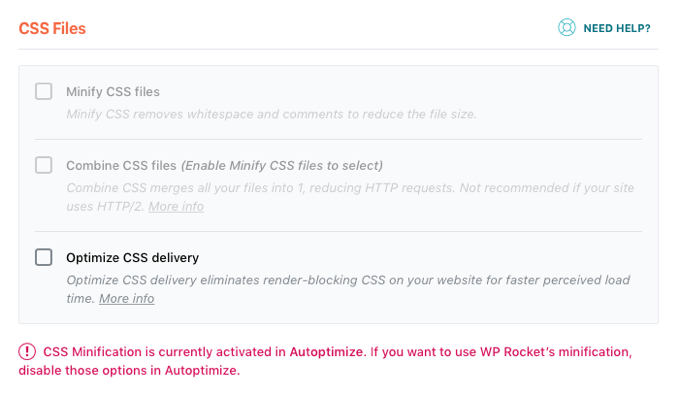 Note: If you use the CDN feature in WP Rocket, make sure to also enter your CDN URL in the Autoptimize CDN options so your files will still be detected and minified.